When there are not enough zebra crossing, it's the time to paint them. Source: Didier Courbot. 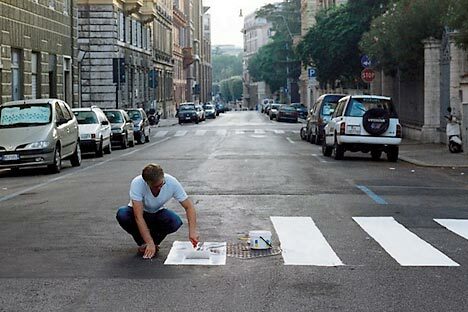 Paint a zebra crossing. Put up a park bench in your building’s courtyard. Create a little comfort for homeless alcoholics. Draw up a map of cycling routes. And do it all while bypassing the official bureaucrats. “Partizaning” can be worthwhile – and fun, too. The idea behind Partizaning is for citizens to improve their city by themselves and fix up the infrastructure on their own, without waiting until the municipal authorities to get around to it. Activists in the Partizaning movement focus on almost anything related to the urban environment – be it zebra crossings, road signs, bike routes, pavement, courtyards, or similar projects. Partizaning – from the Russian word for guerilla, partizan – is the brainchild of Anton Make and Igor Ponosov. It emerged when Anton sat down to draw up a map of Moscow bike trails, charting the best would-be routes for cyclists to take in the city. The Russian capital was lagging substantially behind other European cities when it came to provisions for cyclists. Anton’s first maps were on paper, but they later shifted to electronic maps. Anton soon attracted media attention, and the concept began to gain popularity. Partizaning activists set up various local projects to make their surrounding area a friendlier place to be and the city an easier place in which to live. They disguise themselves as city road workers and paint zebra crossings, put up park benches and erect self-made road signs where they believe such things are needed. The results of these creative initiatives have been varied. Benches have frequently been either smashed or stolen, and road signs are often removed. But there have been positive outcomes, too. For example, a few days after some partizans had painted a zebra crossing on a Moscow street, real municipal workers turned up to repaint it officially and put up the requisite road signs. “We want our activities to show people that they can change the world by themselves. Don’t sit waiting until the pen-pushers finally get around to it. Just get up and get on with it,” said Igor. Igor, Anton and their fellow Partizaning enthusiasts carry out research, talk to the locals and find out what people feel is lacking in their area. They do this by putting up mailboxes around the city for people to drop their ideas into, talking to people in the communal courtyards of their apartment blocks, and through internet campaigns. Igor says that many people do not want park benches put up in their building courtyards, because they attract alcoholics, homeless people and groups of noisy youngsters. In fact, residents often even remove benches that the authorities have put there. “Right now, we’re working on setting up special areas for alcoholics and those who want to drink in communal courtyards. These people have nowhere to go; they don’t have the opportunity to socialize, and this adds to the isolation such marginal groups have from mainstream society. We could put up special benches for them, sandboxes for their cigarette stubs and waste bins for the bottles. Of course, this is only an outline. Maybe it won’t actually go ahead,” Igor said. There is no shortage of ideas amongst the urban partizans. More often, there is a shortage of time and resources; all the urban projects are financed either by the activists themselves or by using funds collected from people sympathetic to their cause. Those who want to see change in their cities (but do not have the time to participate in the activities themselves) can transfer money to the movement’s e-wallet, so that others can bring their ideas to life. Anton and Igor have set up the site www.partizaning.org, where they write about the results of projects, share their experiences and discuss projects which have been run in other countries. “Our site includes information about various urban initiatives that are similar to Partizaning. For example, in Europe there is so-called tactical urbanism. The difference is that our street projects are happening more-or-less in the background, whereas their projects are in the mainstream. In Western Europe, tactical urbanism involves a range of designers, artists, architects and so on. This means that their primary focus is on visual appearance, while ours is on functionality. Their projects are more attractive and polished – ours are a bit more marginal,” said Igor. Urban partizans often resort to actions that are not exactly legal. For example, anyone found painting their own zebra crossing faces a statutory penalty of 1,500 rubles (about $48). The partizans are well aware of the anarchic nature of their activities, but they believe it is the only way that anything can ever be improved. The geographical scope of Partizaning projects has long since spread beyond Moscow. There have been regular initiatives carried out in St. Petersburg, Novosibirsk, and other cities, more-or-less resembling what Anton, Igor and their colleagues have been up to in Moscow. However, there’s no underlying structure to all of this – the movement develops spontaneously. Some people would argue that the anarchy behind Partizaning prevents it from ever becoming a serious influence on life in the city. But the partizans continue to paint zebra crossings, replace broken benches in courtyards and use all their efforts to prove skeptics otherwise.